We're thrilled to say that legendary spy Condor has returned, and we've got him in paperback and eBook! 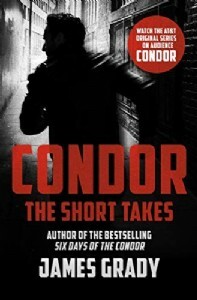 In Condor: The Short Takes, James Grady collected five classic Condor stories and wrote a brand-new novella featuring the character. And the timing could not be better, with the AT&T original series on Audience headed into a second season. Grady will be signing copies on April 3 at The Mysterious Bookshop in Manhattan starting at 6:30 p.m. He'll also be at Politics and Prose in DC on April 30 at 7 p.m. So get your copies signed, or just pick it up through this link!